While the Criterion Collection is renowned for bringing to light obscure and forgotten cinematic works from across the world, they are also responsible for preserving some of the lesser known works of the great masters. 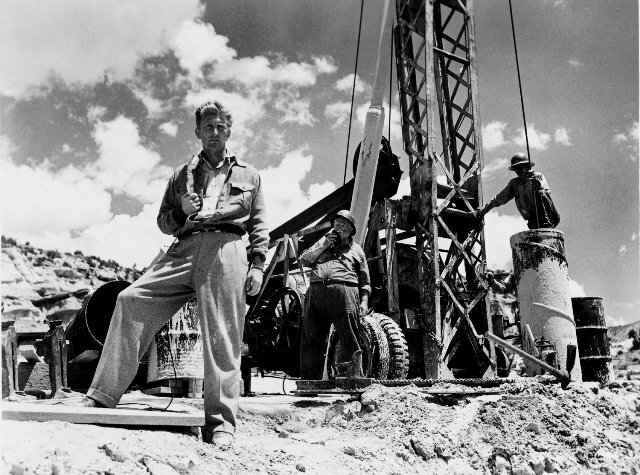 Legendary filmmakers like Stanley Kubrick and John Ford have become a part of the Criterion library, with deluxe editions of some of their earlier films like Spine # 516 Stagecoach (1939) and #538 Paths of Glory (1957). While some of these may not be as obscure as other titles in the Collection, Criterion nevertheless honors these directors by giving worthy notice to a few of these films, showing just how important they are to the growth of cinema in general. In recent years, Criterion has also been looking for even more prestigious films to include in it’s library, including some of the most beloved movies of all time. Among their titles today are some Oscar-winners like Laurence Olivier’s 1948 Best Picture winner Hamlet (Spine #82) and Elia Kazan’s 1954 winner On the Waterfront (#647). Not only does the inclusion of these beloved masterpieces give a special acknowledgement to the filmmakers within the Collection, but it also shows that Criterion celebrates the Golden Era of Hollywood just as much as they do the art house scene. And one particular Hollywood master has been long celebrated as part of the Criterion Collection, all the way back to even the early years of the label. That director of course is the “Master of Suspense;” Alfred Hitchcock. Hitchcock is widely considered to be one of Hollywood’s greatest filmmakers, if not the greatest. No other director was more consistent in Hollywood, while at the same time breaking new ground with every production. Most of his films are legendary; Psycho (1960), North by Northwest (1959), Rear Window (1954), and The Birds (1963) just to name a few. In fact, the British Film Institute, for the first time ever, named a Hitchcock film as the “greatest movie ever made,” that being 1958’s Vertigo; it took the honor away from Citizen Kane (1941), which held that spot for over 40 years. While these popular movies are kept in the public eye by the studios that made them, Criterion has also contributed greatly to showcasing the works of Alfred Hitchcock. At one point, the Criterion Collection had seven Hitchcock films in their library. These included the movies made during Hitchcock’s first few years in Hollywood; 1940’s Oscar-winner Rebecca (#135), 1945’s Spellbound (#136) and 1946’s Notorious (#137). 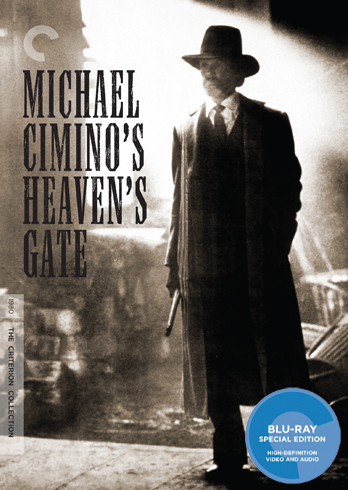 These Criterion editions have unfortunately gone out of print, and have returned back to their original studios for new editions, but Criterion still maintains the licence to a few other Hitchcock titles. These are mainly the ones that were released during the earliest part of his career, back when he was still cutting his teeth in the British film industry. It’s interesting looking back at this period in Hitchcock’s career, as we see the beginning of some of the things that would become synonymous with Hitchcock’s later work. And if there is one Criterion film that best illustrates the beginning of the Hitchcockian style, it would be 1935’s The 39 Steps (Spine #56). The 39 Steps (1935) is small in scale compared to some of Hitchcock’s other great works, but all of the pieces are still there. In fact, this film helped to introduce many of Hitchcock’s most familiar trademarks. Apart from the obvious “wrong man” scenario, which would become a favorite theme in Hitchcock’s later works like North by Northwest, this film also introduced the idea of the MacGuffin to the cinematic language. A MacGuffin is a cinematic term, coined by Hitchcock himself, that refers to the thing that the main characters are searching for, but in the end turns out to be something inconsequential to the audience. In other words, it’s the thing that drives the motivations of the plot; making the directive more important than the actual reward. Hitchcock’s uses of a MacGuffin in a movie are pretty noteworthy and here it’s pretty much the focus of the entire film. In the end, we learn what the 39 Steps is during the final scene, but that piece of information really amounts to very little. What we remember is the heart-pounding search to find it, and that’s what Hitchcock is known best for. He was the “Master of Suspense” for a reason, and this film clearly shows how he refined his cinematic voice around this trademark. You can also see in this movie how the director was finding his style as well. The film features stunning camera work, which helps to elevate the suspenseful nature of the movie very well. The scenes in Scotland in particular have a nice gloomy feel to them. But, it’s the use of close-ups and quick-editing where we see the Hitchcock of later years start to develop, and it’s clear to see how this same filmmaker would redefine Hollywood movie-making in the years to come. Does the film hold up against it’s more famous descendants? It’s hard to put this film in the same category as some of Hitchcock’s later classics. After all, Hitchcock’s prime was really in the 1950’s, when he pretty much could do no wrong. The Hitchcock of the 1930’s was still trying to figure things out and probably didn’t have the same kind of control over his vision that he soon would have. At the same time, The 39 Steps is still a very effective movie, and still holds up as a great example of early suspenseful story-telling. Robert Donat makes a fine leading man in the film, playing the determined and resourceful Hannay with a lot of charm. He embodies that “every man” sensibility that Hitchcock always loved to put into his main characters, and he gives the character a believable intelligence throughout. The writing also retains much of that classic British wit that Hitchcock’s films are known for, especially the earlier ones. It’s clever, without being too complicated, and it treats it’s audience intelligently, never resorting to spelling things out for us. Hitchcock’s macabre sense of humor is also present in the movie, albeit more subdued here than in many of his later films. Also, the black-and-white cinematography is gorgeous, showing Hitchcock’s keen eye for composition. If the film has a major flaw, it’s the fact that it feels small. The film is relatively short at 86 minutes, compared to Hitchcock’s later films which ran on average around 2 hours. While it does fill it’s run-time with plenty of story, it feels like more could have been built upon the mystery. Instead, the majority of the movie gives us the typical man on the run scenario, which gets worn out by the 1 hour mark. Thankfully, the film finishes strong with a very memorable climax. It’s clear that Hitchcock was still trying to figure out the “wrong man” narrative here, and this film feels like a good test run for his later movies like North by Northwest. Criterion, of course, treats all of it’s new titles with special care, and Hitchcock’s 39 Steps is no different. Given that the movie is very old, it needed to be given a special restoration in order to bring out the best possible image quality. The 39 Steps was selected as a Criterion title very early on, and was released on DVD way back in the late 90’s. The image quality of the DVD release was passable, but nowhere near what the film should actually look like. So, when Criterion prepared the film for a Blu-ray re-release in 2012, they gave the movie a proper high-definition restoration. The results of Criterion’s efforts are astounding. The film, naturally, hasn’t looked this good in years. While still maintaining the grainy look of a film it’s age, the restoration has helped to boost the levels of sharpness and detail to the image. Color contrast is always something to take into consideration when restoring a black-and-white film, and here the gray levels contrasted with the blacks and whites feels a lot more natural and authentic. The sound quality has also been cleaned up, and is now free of the pops and buzzes that usually plague an older soundtrack. Is it the best possible picture and sound that we’ve seen from Criterion. Unfortunately, the original film elements were unavailable to Criterion, due to the original negative being lost to time. But, Criterion did the absolute best that they could here, and the film has thankfully been cleaned up and preserved digitally for all of us to enjoy. Given that it’s Hitchcock, the standards are pretty high, and Criterion does the legacy proud here. 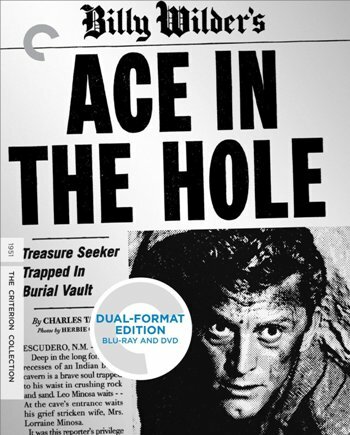 The Criterion edition also features a good sampling of bonus features, many of which were carried over from the original DVD. First off, there is an Audio Commentary by Hitchcock scholar Marian Keane. Ms. Keane’s commentary is more of a lecture style analysis of the movie’s larger themes and the film’s lasting legacy. This isn’t the kind of commentary track that you listen to for a breakdown of how and why the film got made, like so many director’s commentaries do. This is more like the kind of analysis that you would hear in a college level film course, which is not bad if that’s something that interests you. Marian Keane’s analysis is informative and well-researched. Just be warned that it’s also very scholarly as well, and in no way substitutes for a behind-the-scenes look. A documentary included on the disc does however go into the making of the film a little bit more. Also carried over from the DVD is Hitchcock: The Early Years, which details the director’s early films made in his native England, including this one. A complete radio dramatization is also present on this edition, created in 1937 for the Lux Radio Theatre show and starring Ida Lupino and Robert Montgomery in the roles of the main characters. New features added exclusively for the blu-ray edition include footage from a 1966 interview with Hitchcock done for British television, where he talks a little about the making of this film. Also, another Hitchcock scholar, Leonard Leff, recorded a visual essay, which goes into further detail of the film’s production. Rounding out the special features is a gallery of original production design art, as well as an excerpt from another interview of Hitchcock, conducted by another filmmaker, Francois Truffaut. All in all, a very nice set of features that makes this set feel very well-rounded. If you consider yourself a huge fan of Alfred Hitchcock, chances are you already are familiar with The 39 Steps and it’s place within the master’s entire filmography. While it may not be as exciting as North by Northwest, or as chilling as Psycho, or as emotional as Vertigo, it nevertheless represents a nice stepping stone towards some of those later masterpieces. I certainly look at it as a prime example of Hitchcock’s earliest work, because you can see all the elements there that would come to define his entire career. It’s movies like The 39 Steps that really illustrate perfectly the maturing of a filmmaker, and even though it doesn’t reach the heights that we know now that Hitchcock was capable of, it still stands on it’s own as a fine piece of entertainment. I certainly recommend it for anyone who just wants to see a good old fashioned spy movie. There were many others like it at the time, but few feel as effortless in it’s suspense as The 39 Steps does. There are other Criterion editions of films made during Hitchcock’s early years, and they are worth checking out too, like 1938’s The Lady Vanishes (Spine #3) and 1940’s Foreign Correspondant (#696), which was the last film Hitchcock made before his move over to American cinema. 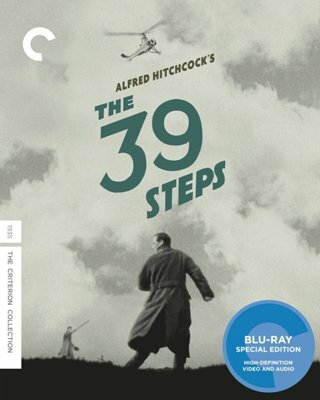 The 39 Steps unfortunately has been overlooked over the years as a defining film in Hitchcock’s career, so this Criterion edition is a welcomed spotlight for a movie that is deserving of it. 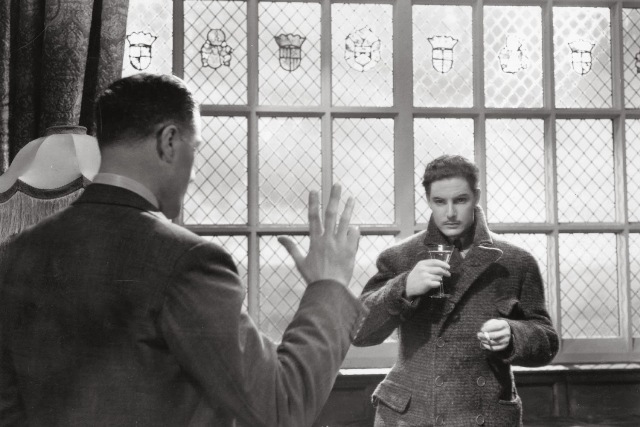 It’s always great to see where the beginnings of a great filmmakers style came from, and The 39 Steps is the kind of movie that shows that off perfectly. Hitchcock holds an honored place in the Criterion Collection, and hopefully that spotlight will continue to extend to many more of the director’s great early films. The Criterion Collection is notable for presenting and preserving some of the world’s most beautiful and life-affirming movies in it’s library. But, at the same time, Criterion has also made an effort to preserve examples of the truly bizarre and grotesque from cinema’s history. Apart from some classic B-movie horror films from Hollywood like 1958’s The Blob (Spine #91), there are other bizarre movies in the Criterion library like the Andy Warhol-produced Flesh for Frankenstein (#27), or the silent occult documentary Haxan: Witchcraft Through the Years (#134), as well as the works of avant-garde filmmakers like Luis Bunuel (#102 The Discreet Charm of the Bourgeoisie) and Pier Paolo Pasolini (#17 Salo, or The 120 Days of Sodom). While some of the most shocking and button-pushing films have come from international releases, where censorship standards are much looser, Criterion has also sought out some shocking movies that are come from closer to home. Case in point, some are films from our neighbor to the north, Canada, and one of their most celebrated and challenging auteur filmmakers; David Cronenberg. Cronenberg’s film career is an interesting one, considering that some of his movies have actually become mainstream hits (1986’s The Fly, 2005’s A History of Violence, and 2007’s Eastern Promises), but some of his earlier and more obscure films are worth a revisit too, and thankfully he has allowed Criterion the opportunities to give them the presentations they deserve. One particular title of Cronenberg’s that has been given new life as a Criterion title is his sadly little seen psycho-sexual thriller, 1983’s Videodrome (#248). Videodrome was one of Cronenberg’s most ambitious films in the early part of his career, riding high off the success of his previous thriller Scanners (1981). The film featured a then rising-star James Woods in the lead, as well as Blondie lead singer and pop icon Deborah Harry as his love interest. The film also featured some groundbreaking make-up effects that brought to life some of the film’s more shocking moments. Unfortunately, the film didn’t click with audiences the same way that Scanners did, or for that matter, his follow-up success with The Fly. 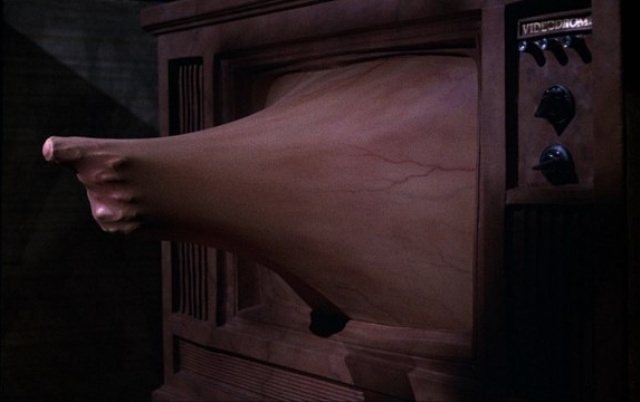 Videodrome‘s lukewarm reception from critics and audiences may have had less to do with it’s gory elements, and more to do with it’s satire on the media and politics of the day. The movie is a hard one to define simply, given the story-line’s heavy reliance on explaining how TV broadcasting works, but it’s a film that still sticks with you long after you’ve seen it. 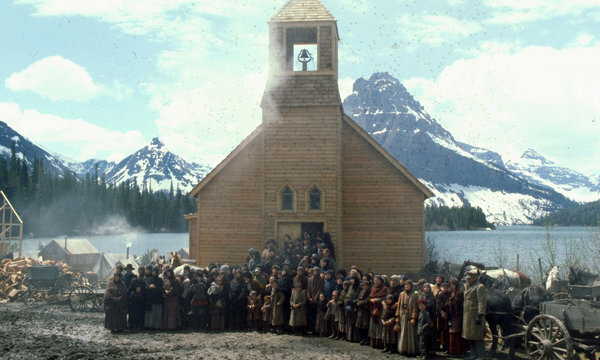 In many ways, the movie has benefited from the passage of time, as many of the themes in the film are actually playing out more clearly in society today, and this is probably why the film has developed a devoted cult following over the years. 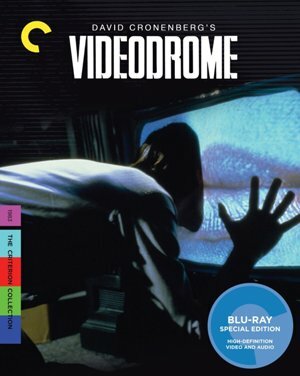 Criterion’s edition of Videodrome helps to carry Cronenberg’s vision into the new century with both a deserving restoration that quite literally will blow away your TV and a slew of extra features that really plunges the viewer right into the center of the madness behind the film. The story itself is definitely a product of it’s time, and yet still very much ahead of it’s time, and very accurate in some of it’s predictions. Max Renn (James Woods) is a sleazy cable TV programmer who is looking for the next big thing to draw in audiences to his channel, which caters to a very adult audience. The problem is that by pushing the envelope with every new show, he has found that audiences have become desensitized and are no longer shocked by what has been putting on the air. This leads to the discovery of a video tape called Videodrome. Videodrome, on the surface, looks like a sado-masochistic snuff film, which even Max Renn finds uninteresting at first. But, over time, he becomes hypnotized by the tape and watches it continuously over and over again. He sends his girlfriend Nicki Brand (Deborah Harry) to investigate the source of the tape, which she does willingly, but she soon disappears. It’s not long before Max receives more Videodrome tapes, only this time with Nicki featured in them. Max soon starts hallucinating as he watches, with bizarre things happening to him like a cavity opening up in his chest from which he pulls out a fleshy, blood drenched pistol. Max tries to uncover what’s happening to him psychologically, what’s happened to Nicki, and the secrets behind Videodrome, which soon leads him into the depths of a deep-seeded political conspiracy. It’ll be readily apparent that Videodrome is not for the casual viewer. It can even be quite disturbing at times, particularly when Max starts becoming overwhelmed by the hallucinations that are plaguing his mind. These scenes in particular are the standouts in the movie, and feature some of the film’s most impressive visual effects. Made long before CGI would become the norm in film-making, every special effect in this movie had to be done with practical elements. Some of those effects are still impressive today, like when Max’s TV screen starts to expand out and become almost malleable, which soon causes Max to rub his face into it (an image which Criterion uses for the box cover). Also, the part where Max reaches into his own chest is another impressive effect, one of which I’m sure will make one or two viewers queasy upon seeing it. What pleases me most is that Cronenberg’s vision is truly a unique one, and this movie probably more than any other manages to make those visions come to life in unforgettable ways. Cronenberg definitely has an affinity for taking everyday things and giving them a grotesque and almost monstrous quality. That is certainly true in the later parts of the movie when Max carries a gun around that seems to have been fused to his hand in a puss-riddled fleshy shell. Again, some really sick stuff, but Cronenberg’s effects team did go all out and made this grotesque imagery something really special. The film is also interesting given the themes of it’s story. In many ways, it actually predicted many things that came true in the years since it’s release. Sure, the movie is dated a bit by the limits of technological advances known in it’s time, but some of the ideas behind the movie have held up well. The idea of technology and media content leading individuals towards obsessive behavior is something that we have seen play out in our society over the years, and it’s a central idea within the plot of Videodrome. With the internet giving us access to any kind of content we want, with very little in the way of restrictions, it becomes more likely that anyone can become consumed with the impulsion to obsess over certain things. Not only that, but like the audiences that Max Renn is catering to with his channel, we are becoming more and more desensitized to what we see on the internet. Likewise, when we obsessive over certain things, we become more susceptible to manipulation; whether it is by our political leaders or by those around us. That’s what Videodrome ultimately leads up to with it’s messages, and it’s amazing to think that Cronenberg and his team were contemplating these larger ideas in a time long before anyone had even a notion of what was to come with the internet. The idea that we become slaves to our lives in interactive media is probably the film’s most unsettling element and the one that continues to keep this film relevant so many years later. A lot of credit should go to the cast for making this film work. This may have been the point in James Woods career when he was beginning to be typecast in sleazy businessman roles (something which he has struggled to break out of ever since), but his performance as Max Renn is still a very strong one. Woods perfectly captures the slow devolution of the character as he plunges deeper into madness. You forget how good of a leading man he can be sometimes, and this movie gives him a starring role that perfectly fits his talents as an actor. The film pretty much rests on his shoulders and he managers to carry it through, even when it moves into it’s truly bizarre moments. Deborah Harry doesn’t have as much screen-time, but she’s used very effectively in the movie as well. She’s particularly unsettling in those hallucinatory moments, and there’s a sensuousness to her performance that really makes her a standout. Rarely do you see music icons feel completely comfortable in an acting role, but Deborah manages it very effectively, and not once will you feel like she’s out of place. I also like the whole look of the movie as well. This film definitely has an early 80’s schlocky style to it, reminiscent of slasher movies like Nightmare on Elms Street, but Cronenberg balances that out with some really interesting stylistic choices. During some of the more sensual, hallucinatory scenes, the film starts to feel more like a film noir thriller. Also, the actual design of the “Videodrome” seems inspired by the style of Stanley Kubrick, in terms of it’s set-up and lighting. It all adds to a very interesting cinematic vision, one of which feels uniquely Cronenberg. So, how good is the Criterion Collection’s edition of the movie. First of all, the restoration of the movie is excellent. The film is, of course, limited to the low-budget production that it is, and will not look as fresh and sharp as something that was made more recently, but for a 30 years old movie like this one, it looks outstanding on blu-ray. The colors in particular, something that is particularly evident in Cronenberg’s style, really pops out in high-definition. And for an early 80’s flick, the film elements have really held up well, especially in contrast with the VHS video playback that you see periodically in the movie. That alone shows you just how superior a good high-definition presentation is. The extras also give us a detailed look at the movies making and it’s legacy. You get two great audio commentaries; one from Cronenberg himself, and the other with stars James Woods and Deborah Harry. There are also numerous making-of documentaries on the films special effects, a gallery of production materials and behind the scenes photos, as well as a short film called Camera which Cronenberg made specially for the Toronto Film Festival in 2000. My favorite extra, however, is a feature called Fear on Film, which is a 26 minute round-table discussion with Cronenberg himself and some of his film-making peers; John Landis and John Carpenter. Seeing these three iconic directors discussing their work and horror cinema in general together is a real treat, and well worth the price of the Criterion edition alone. So, is this a Criterion title worthy of the brand. As a cinematic achievement, I would absolutely say yes. David Cronenberg’s Videodrome is an expertly crafted film that really holds together and has actually become more interesting as a story-line since when it first premiered. Would I recommend it as part of your own Criterion collection. That all depends on your own tastes. Like I said before, Videodrome is not for everyone, and I’m sure that there will be more than one person who will be either grossed out by it, or will probably not get the meaning of it at all. I for one found it to be a very interesting cinematic experience, and I would recommend the movie as at least a rental. For many people, these kinds of movies are made for specific audiences, and Cronenberg’s films are still are an acquired taste for many people, much like the works of David Lynch. One thing that I find interesting is that I actually prefer Cronenberg’s films to Lynch’s. Both directors have made careers out of examining the grotesque and the bizarre in everyday life, but I feel like Lynch is more style over substance; again, it all comes down to cinematic tastes. In the end, I highly praise the job that Criterion has done on this title, especially with the Fear on Film extra feature that accompanies it. It’s a challenging piece of cinema, but one that I’m sure will help you admire the Cronenberg style and want to explore it deeper. Just don’t give into it’s hallucinatory pull. The Criterion Collection is known for being the distributor of some of the greatest and underseen classics of yesteryear, but they also have a reputation for putting out modern films as well. In fact, if you look at the complete collection entirely, you’ll see that a good percentage of the titles are ones from the last 20 years or so. This does open up the debate over whether or not the Criterion Collection has a high enough standard over which titles it includes, considering the fact that it takes time for a film to earn the status of a classic. 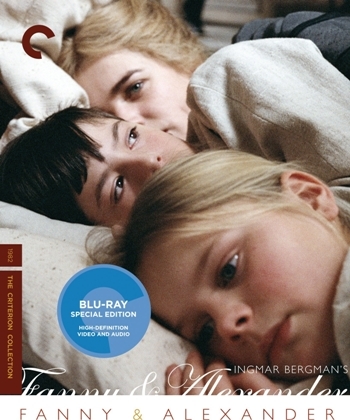 Some of Criterion’s more controversial choices for inclusion in recent years have included the films of David Fincher (#476 The Curious Case of Benjamin Button, #627 The Game), a film by Girls star and creator Lena Dunham (#597 Tiny Furniture) and also the movies of Michael Bay, I kid you not (#40 Armageddon, #107 The Rock, both now out of print). This begs the question of what makes a film a classic and if Criterion are the ones responsible for making that decision. I’m sure that Criterion would themselves say that they choose titles not because of their status as a classic, but on whether or not it’s a title that will sell well in the video market. The fact that they devote so much time and effort to make the editions of their titles so good is one of the things that has set them apart. And the reason why they choose to release films from contemporary directors is so that they can get the filmmakers’ actual input on the release of their films in the collection, as well as their approval. One director who has not only had his whole filmography released under the Criterion label, but has also had his career boosted by the Collection as well, is Texas-born filmmaker Wes Anderson. Anderson is a very polarizing director, mainly due to his very distinctive style. His films usually are identified by their quirky story-lines and characters, their unconventional use of pop songs (mainly from the 60’s and 70’s) to underscore a scene, the bold use of colors and deliberate composition in the cinematography, and last but certainly not least, the presence of the great Bill Murray. Some people either love Wes Anderson’s movies in all their eccentricities, or loathe them as being nothing more than style over substance. While I can see how some people dislike Wes Anderson’s style, I for one can’t get enough of it. I have yet to see a Wes Anderson film that I didn’t like; even the one that left me a little underwhelmed (Criterion #450 Bottle Rocket) was one that I could still appreciate. And part of what has made me a fan of Wes Anderson’s work has been the excellent Criterion releases devoted to his films. So far, six of his movies have been released as part of the Criterion Collection: the aforementioned Bottle Rocket (1996), #65 Rushmore (1998), #300 The Life Aquatic with Steve Zissou (2004), #540 The Darjeeling Limited (2007), and coming next February, #700 Fantastic Mr. Fox (2009), which was my personal pick for the best film of 2009. One film in particular does stands out, mainly due to it’s early popularity, as a film that really began to define Wes Anderson’s status as a filmmaker: that being #157, 2001’s The Royal Tenenbaums. The movie follows the struggling relationship between members of an affluent, but fractured family. The patriarch, Royal Tenenbaum (a perfect Gene Hackman) finds that the funds that have helped to support his decadent lifestyle have been drying up, and this leads him to turning back to the family that he had all but cut ties with years ago. The once proud family, made up of three former “wonder kids” now in their adulthood, are also struggling to take control of their lives. Chas (Ben Stiller) a Wall Street hot shot in his youth, who’s now struggling to keep everything afloat as a single father after his wife had died in a plane crash. Adopted daughter Margot (Gwyneth Paltrow) gave up a promising career as a playwright in order to settle down in a now loveless marriage with psychologist Raleigh St. Clair (Bill Murray). And Richie (Luke Wilson), the youngest, had a promising career as a tennis phenom, before he began to lose his game and faded into obscurity. Etheline Tenenbaum (Angelica Huston), the mother, has manged to keep her house in order despite the hard times with the help of her accountant Henry Sherman (Danny Glover), who has suddenly shared his growing affection with her. This prompts Royal to step in and reclaim his family before he loses them forever. And how does he do this? By telling them all that he’s dying of cancer, which is a flat out lie. The film is a loaded one to be sure, and I wouldn’t disagree that Wes Anderson sometimes struggles to keep everything in check over the course of the run-time. But, The Royal Tenenbaums is nevertheless a very effective and charming movie. What makes it work so well, no doubt is the cast. Gene Hackman is outstanding as Royal Tenenbaum, and he steals every moment he’s on screen. What I love is the fact that Royal is so likable in this movie, even when he’s doing and saying the most horrible things. Wes Anderson’s scripts, which he co-writes on every movie (this time with co-star Owen Wilson), are known for their sly, and rather outlandish sense of humor, and no character better exemplifies that than Royal. I especially like the way that he takes little consideration of other peoples feelings, even when he’s in direct conversation with them. An awkward exchange with Chas at a cemetery in particular is both an uncomfortable and laugh-out-loud funny moment in the movie (“Oh, that’s right. We’ve got another body here.”) Gene Hackman alone would been enough to watch this movie, but the rest of the cast is also excellent. Angelica Huston brings a lot of class to the character of Etheline and helps to give the film its moral center. Gwyneth Paltrow is hilariously deadpan as Margot. Ben Stiller and Luke Wilson deliver some of their best performances as well. And Anderson regular Bill Murray is absolutely hilarious in his few moments onscreen. Add in Owen Wilson as ticking timebomb next-door neighbor and author named Eli Cash, and you’ve got a very well rounded cast. If the film has a flaw, albeit a minor one, it’s the fact that it feels unfocused. I mainly see this as a byproduct of trying to fit too many things into one film. The cast of characters is enormous, and trying to give everyone enough screen time is a daunting task for any filmmaker. The Royal Tenenbaums was made in the early part of Wes Anderson’s career, at a time when he was still figuring things out. Looking back on the film, you can see that his style was still forming at this point in time. 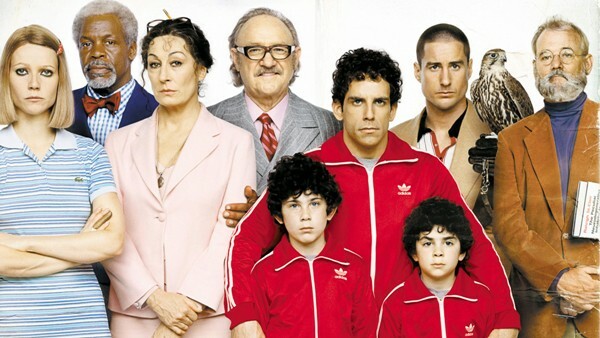 The Royal Tenenbaums would be Anderson’s last film to feature a kind of naturalistic aesthetic look to it, as he began to head in a much more whimsical and cartoonish direction with his next film The Life Aquatic. I think that the more subdued visuals of Royal Tenenbaums is probably why this film has remained to date one of Wes Anderson’s more popular films. It’s undoubtedly his most mainstream film to date, though The Royal Tenenbaums is not a conventional Hollywood movie by any means. But as a part of his overall body of work, I see this movie as one of his lesser efforts. I still love it, don’t get me wrong, but when I think of a Wes Anderson movie, this is not the one that comes to mind. I think of his later films as being the ones that really define him as a director, given how much more assured they are. But, I am glad to see how well this film has held up both as a movie and as a part of the director’s full oeuvre. What is significant about the Criterion edition of this film is the fact that it was released as part of the collection almost instantly. Like I had said before, sometimes it takes a while for a film to achieve classic status, and only then it may find it’s way into Criterion’s catalog. 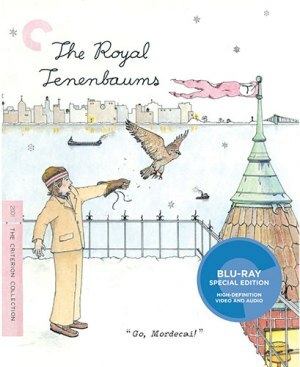 The Royal Tenenbaums, however, was selected to be a part of the collection right when it left theaters; the shortest window ever for a Criterion title. The choice was made probably because of the fact that Wes Anderson’s previous film, Rushmore, sold so well under the Criterion label in the years after it’s premiere. Adding The Royal Tenenbaums seemed like a no-brainer choice, especially after it’s own successful run in theaters. But, what’s even more remarkable is the fact that Criterion had the exclusive rights to the film’s DVD release, thanks to a deal with Touchstone Pictures who financed the movie, and they made the movie available to the mass market. You have to understand that this was an unusual move on Criterion’s part. Up until that point, Criterion released their titles in small quantities and usually limited the availability to a few select retailers nationwide. In my home town, I would usually only find a Criterion movie section in my local Barnes & Nobles, and that was it. So, the fact that The Royal Tenenbaums was so widely available was a significant game changer for both Wes Anderson and Criterion. I’m sure that for many people, Royal Tenenbaums had to have been their first Criterion title, which opened up the gates for a whole new audience for the distributor. The Royal Tenenbaums DVD release back in 2002 was an enormous success, making the movie one of Criterion’s best-selling titles. Last year, they revisited the film again with a Blu-ray edition, which helps to give this 12 year old film a fresh new look. The movie is stunning in high definition, as is every other Wes Anderson film. This is probably why the director has become a favorite among Criterion collectors like myself; his bold use of colors brings out the full potential of the color range and brightness in a Blu-ray presentation. The blu-ray edition also carries over every bonus feature from the previous DVD release. Among the extras found here are a Director’s commentary by Anderson himself. There’s an interesting filmmaker profile of Wes Anderson made by none other than acclaimed documentarian, Albert Mayles. There are also a dozen or so behind the scenes clips of the actors at work on the set, along with some interviews. There’s also a fun little faux talk show made by Anderson called The Peter Bradley Show, which highlights miscellaneous people involved with the film like extras, grips, and the late Kumar Pallana, who played Royal’s butler in the movie. Also included in the set are original artwork pieces by Wes Anderson’s cousin and resident company artist, Eric Anderson, whose style perfectly compliments the movie. In fact, the Criterion Collection has used Eric Anderson’s artwork for every one of their Wes Anderson titles, including using some of them as the cover art for each edition, including this one. So, The Royal Tenenbaums stands as not just an important release for Wes Anderson, but as a groundbreaking movie for their the Criterion brand as well. I’m sure that a lot of people have this film to thank for introducing them to both Criterion and Mr. Anderson. The film has aged very well over the years, though I think that it’s clear that Anderson has clearly moved on to bigger and better movies since then. The Royal Tenenbaums was a launching point for him; an opportunity to show what he can do with more tools at his disposal, and I’m happy that the end result was as successful as it was. My hope is that Wes Anderson continues to stick by Criterion and have every one of his releases available under their label. The one holdout is last year’s Moonrise Kingdom (2012), but I’m sure that a Criterion edition is in the works for it in the near future. The years ahead also looks bright for the director. His next film, The Grand Budapest Hotel is set for release next March and the trailer alone is enough to make me smile. I also like the fact that Wes Anderson’s style has clearly become so identifiable now, that it received a SNL send up this year that was both mocking and reverential at the same time. It even included narration from Alec Baldwin, who was also the narrator in The Royal Tenenbaums, showing just how impactful this film has been. Even if you find Wes Anderson’s style a little too quaint, The Royal Tenenbaums is still worth watching. If anything, this Criterion edition will give this film the stunning presentation that it rightly deserves. The Criterion Collection has many selections of classic Stateside films, but what I like is that Criterion is the go to place for home video releases of movies from across the world. This is helpful if your favorite filmmakers are international and have limited access to the American film markets. Famed directors like Jean Renoir, Ingmar Bergman, Sergei Eisenstein, and the like are found almost exclusively within the Criterion Collection here in America, which makes it likely that any discerning film buff will have one or more Criterion title on their shelf. As a fan of certain directors, I am among those who collects movies according to someone’s distinctive body of work. While it is easy to collect the films of say Spielberg or Scorsese here in America, foreign filmmakers’ movies aren’t exactly published for the mass market here in the same way, unless they are an internationally successful filmmaker like Hayao Miyazaki or Lars von Trier. Hence why I gravitate towards the Criterion Collection when I want to include foreign classics in my film collection, particularly when they come from a one of my favorite directors. In this article, I want to highlight one such filmmaker who stands out as one of my favorites, and whose films have become staples within the Criterion Collection. I am speaking of legendary Japanese director Akira Kurosawa, a filmmaker whose influence is without comparison in world cinematic history. Kurosawa, over the span of his career, directed 32 films from 1943’s Sanshiro Sugata to 1993’s Madadayo. Some of his films have become world renowned classics and in some cases, considered among the best ever made. Some of his most influential films would be his movies depicting the era of the Samurais in Japan’s cultural history. Two of these, Yojimbo (1961) and Sanjuro (1962) would go on to be remade as Westerns by Italian filmmaker Sergio Leone in his A Fistful of Dollars (1964) and For a Few Dollars More (1965). Given that Akira Kurosawa was heavily influenced by John Ford westerns in his youth, I’m sure he would have found these remakes appropriate. Yojimbo and Sanjuro are available in the Criterion Collection, but the title that I wish to focus on is one considered to be Akira Kurosawa’s masterpiece, and one of Criterion’s best titles to date. That film is 1954’s Seven Samurai (Criterion Collection #2). The story of Seven Samurai (Shichinin no samurai) is set in the 1600’s, during the Feudal period in Japan. The start of the film finds a small village of farmers tormented by a group of bandits who raid their food supplies and kidnap their women nearly every year. The fed-up farmers make the decision to hire Samurai to protect their village, which is a plan made with some reservations because of the fact that some Samurais are just as bad as the bandits that are attacking them. Still, a group of farmers set out for the city where they run across a veteran Samurai named Kambei (Takashi Shimura), who sympathizes with their plight and agrees to help the farmers in their search for more Samurai. In the end, Kambei finds Seven warriors willing to fight on behalf of the farmers, even for the limited offerings that the peasant farmers can give them. Among the Seven is a hot-head with a giant sword named Kikuchiyo (Toshiro Mifune), whose Samurai lineage is questionable and who’s more likely to start trouble than prevent it. The remainder of the film follows the Samurai as they fortify the village and help train the farmers to protect themselves for the bandits return. Once the battles begin, it becomes a memorable fight for survival for both the Samurai and the farmers. If the story sounds familiar, it is because it was remade a few years later by director John Sturges as the Western The Magnificent Seven (1960), a rare example of a respectful Hollywood remake of an international classic. Thankfully, the original has stood the test of time and still works just as well today as when it was first released. I should state that Seven Samurai actually stands as one of my absolute favorite movies. To me, it represents the absolute pinnacle of cinematic storytelling. The film’s narrative is very basic, and yet is executed to absolute perfection in both the writing as well as in the pacing. The movie runs 3 hours and 27 minutes, but you would never tell because it holds your attention so completely. The cinematography is both stunning and influential. Many people have often called this the first modern action film, because of Kurosawa’s use of slow-motion and hand-held photography to heighten some of the action scenes; techniques that are still being used today. You also see some of the most iconic uses of Kurosawa’s trademarks in this film; in-particular, the use of rain. The downpour seen in the movie’s legendary final battle is a sight that needs to be seen, and will often leave the viewer wondering how it was all accomplished. The performances are also what makes this film so beloved, even all these years later. Toshiro Mifune was already a popular actor in Japan when Seven Samurai was released, but this film is what turned him into an international movie star and put him on the radar of many Hollywood filmmakers as well. Mifune is simply magnetic in the role of Kikuchiyo, and steals pretty much every scene he is in. He balances both the humorous moments in the film with some of the heavier ones, and makes the character feel wholly three-dimensional in the process. Mifune and Kurosawa would make 16 films together; a partnership unmatched in all of film-making. Takashi Shimura also lends considerable weight to the role of Kambei, the Samurai leader. The remainder of the cast too are also strong. One of the things that I love so much about the movie is the surprising depth that you find in each character, both large and small. Even the many farmers get special treatment in the film’s screen time. It all contributes to one of the most enriching and complex screen stories ever brought to life. 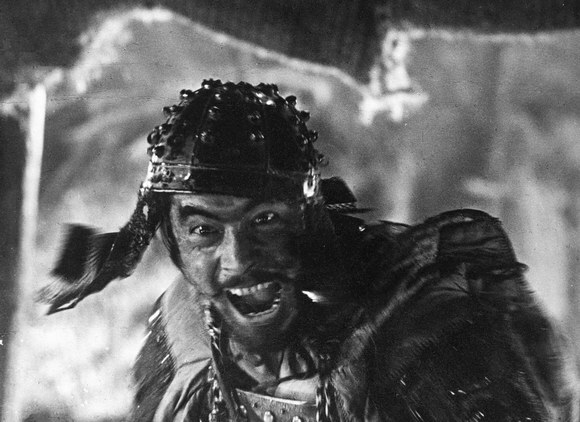 The Criterion Collection’s edition of Seven Samurai is also nothing short of a masterpiece. The film comes in a special two-disc blu-ray set, with the film taking up the entire first disc. The film’s restoration is a perfect upgrade for the film; bringing out every little detail in the nearly 60 year old picture, while still maintaining it’s intended look. The black and white photography is razor sharp and the sound is appropriately mixed to retain the film’s original sound design. For a movie as old as this one, Criterion’s restoration makes it feel both consistent and revelatory to longtime fans of the movie. The extras are also top-notch and worth delving into if you’re a fan of the movie. First there is a trio of documentaries, related to both the film and Kurosawa himself. The first one is titled, My Life in Cinema, and it is a two-hour interview with Kurosawa himself, done in 1993 with fellow filmmaker Nagisa Oshima. The documentary has Kurosawa looking over the works of his career as he films one of his final movies, Rhapsody in August (1991). The second documentary is It is Wonderful to Create, which is part of a Japanese TV series documenting Kurosawa’s filmography, movie by movie. 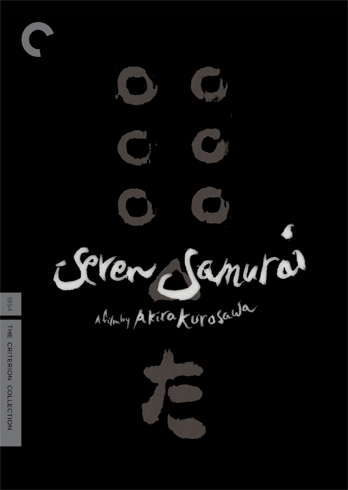 This 50-minute entry of course documents the making of Seven Samurai, and remaining episodes of the series can be found on Criterion editions of each corresponding Kurosawa film. The last documentary, Seven Samurai: Origins and Influences, details both the inspirations in Japanese culture behind the film as well as the influences it made on pop-culture after its release. A gallery of production stills and poster art round out the extras, helping to make this a well rounded special edition. Seven Samurai has earned it’s place in cinema history, and that makes it a no-brainer entry into the Criterion Collection. There are many more Kurosawa classics in the collection, but this is the one that I believe deserves special consideration for any fan of cinema. Criterion’s edition of the film is appropriately top-notch and no one would expect less. 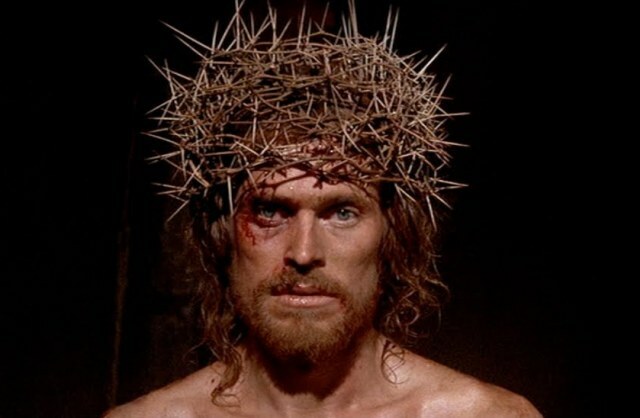 It is worth revisiting again if you have seen the film before, just so you can take in the remarkable restoration. And if you’re a first-timer, you’ll be in for a treat. It’s a movie that really transcends cultural and language barriers and can be appreciated by just about everyone. Kurosawa had that special gift as a filmmaker to make films that were undeniably Japanese, and yet universally appealing. This is a worthy addition to your collection of Criterion films and it certainly holds a sacred place in my own collection.